You might think that two business partners with distinctive approaches to their craft would have very little desire to work together. But at the Martin Ranch Winery, nestled 600 feet up in the Santa Cruz Mountains, just west of Gilroy, the two winemakers on staff have appreciably different styles and opinions, and yet they get along just fine. Good thing, too, since they’re married. Thérèse and Dan Martin have been producing wines now for about 20 years. And while they do everything together, from managing the business, to working in the vineyards, harvesting, crushing and fermenting the grapes, they have very distinctive tastes for the outcome. 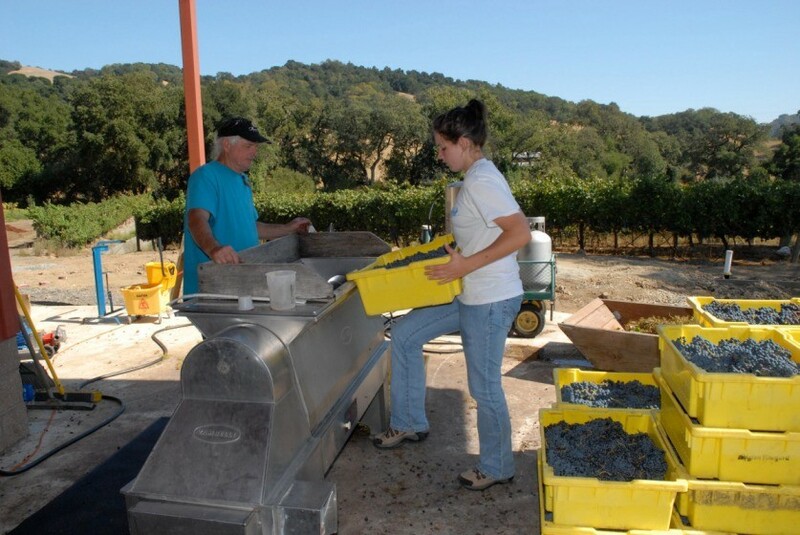 Thérèse and Dan Martin, owners and winemakers at Martin Ranch Winery, Gilroy, CA. Dan is very interested in creating wines that appeal to a large number of people, says Bonnie. His JD Hurley label experiments with blends, apparently with success. His 2014 Cabernet Sauvignon, for example, includes Martin Ranch and Santa Clara Valley grapes. It won Best of Class of Region and was awarded 95 points at the 2017 California State Fair. Thérèse Vineyards, on the other hand, reflects Thérèse’s intent on producing single-varietal “showcase” wines. Her 2012 Estate Cabernet took Gold in the San Francisco Chronicle 2017 wine competition. This is just one of many accolades her label has garnered. In any given year, Dan and Thérèse, who dry farm their vines and are avid practitioners of green production, deliver some 22 different wines. “They are, in my opinion, crafted lovingly and exceptionally well,” says Bonnie. The winery is open to the public the first and third weekend of every month on Friday, Saturday and Sunday. For our Wine Wednesday show we decided to pair Thérèse Vineyard’s 2012 award-winning estate Cabernet with an old Duke Ellington song “Don’t Get Around Much Anymore.” Not that we’re choosing sides or picking favorites. We’re pretty sure the tune would go fine with one of Dan’s blends as well. Wine Wednesday, S.2 E.8: Martin Ranch Winery was originally published in WineWednesday on Medium, where people are continuing the conversation by highlighting and responding to this story. In created nations science is contacting the objectives of wonder. Researchers are anticipating make it conceivable to discover the assets from seas. In the event that researchers get [url=https://www.topdissertations.org/custom-thesis-review/]www.topdissertations.org/custom-thesis-review/[/url] in their central goal it will be heavenly new for entire the world. In created nations science is contacting the objectives of wonder. Researchers are anticipating make it conceivable to discover the assets from seas. In the event that researchers get www.topdissertations.org/custom-thesis-review/ in their central goal it will be heavenly new for entire the world.